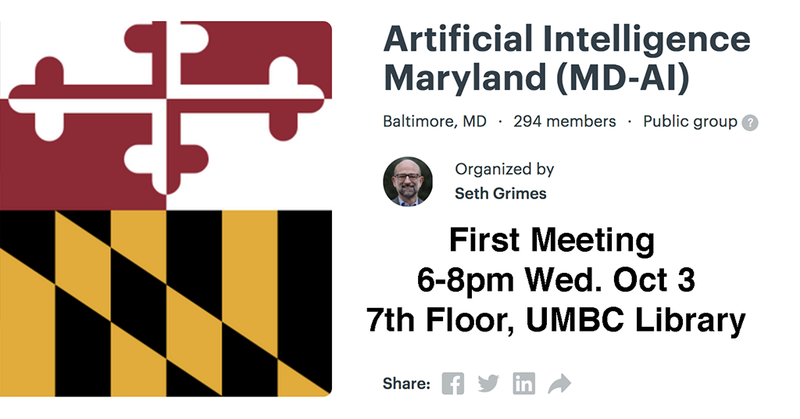 A new Maryland-based meetup interest group has been established for Artificial Intelligence (MD-AI Meetup) and will have its first meeting at UMBC this coming Wednesday (Oct 3) from 6:00-8:00pm in the 7th floor of the library. The first meeting will feature a talk by UMCP Professor Phil Resnik on the state of NLP and an AI research agenda. Refreshments will be provided. The meetup is organized by Seth Grimes and supported by TEDCO, local AI startup RedShred, and the Maryland Tech Council. If you are interested in attending this and possibly future meetings (which will probably be monthly), go to the Meetup site and join (it’s free) and RSVP to attend this meeting (if there’s still room). If you join the meetup and RSVP, you can see who’s registered to attend. These meetups are good opportunities to meet and network with people in the area who share interests. It’s a great opportunity for students who are will be looking for internships or jobs in the coming year.